COATINGSPRO ROOF COATINGS 2018 29 Repair Instead of Replace Because the exterior membrane on non-SPF roofi ng systems acts as the waterproof layer, leaks are more apt to appear immediately following damage. 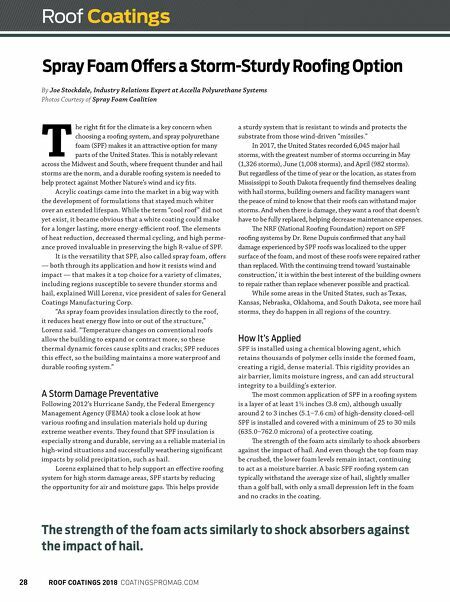 But, according to Lorenz, SPF roofi ng systems continue to provide water resistance even when the coating may be damaged. "Spray foam has very low water absorption and water transmission, so it doesn't readily become saturated," Lorenz explained. "So if the roof coating is punctured and even dented or broken, if it's on the surface ¼ inch [0.6 cm], it can be repaired and recoated. [If ] the damage is greater in depth or more frequent in hails hits, we can scarify or grind off the top ½ inch to 1 inch [1.3‒2.5 cm], and then apply new foam and coating without tearing off the whole roof." But Lorenz noted this would only need to be done on severe hail impact with dense hits or if the roof is neglected after the hail damage and is not repaired in a reasonable time frame. As with any roofi ng systems, it is important to inspect for and evaluate any damage to the SPF roof following a major storm and to promptly and correctly make any needed repairs. 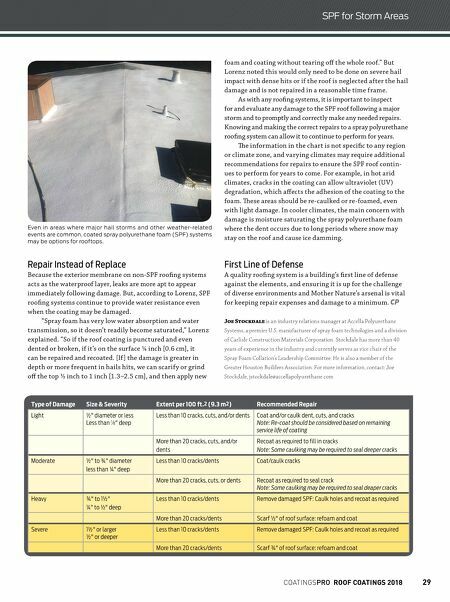 Knowing and making the correct repairs to a spray polyurethane roofi ng system can allow it to continue to perform for years. e information in the chart is not specifi c to any region or climate zone, and varying climates may require additional recommendations for repairs to ensure the SPF roof contin- ues to perform for years to come. For example, in hot arid climates, cracks in the coating can allow ultraviolet (UV) degradation, which aff ects the adhesion of the coating to the foam. ese areas should be re-caulked or re-foamed, even with light damage. In cooler climates, the main concern with damage is moisture saturating the spray polyurethane foam where the dent occurs due to long periods where snow may stay on the roof and cause ice damming. First Line of Defense A quality roofi ng system is a building's fi rst line of defense against the elements, and ensuring it is up for the challenge of diverse environments and Mother Nature's arsenal is vital for keeping repair expenses and damage to a minimum. CP Joe Stockdale is an indust r y relat ions manager at Accel la Poly uret hane Systems, a premier U. S. manufact urer of spray foam technolog ies and a d iv ision of Carl isle Const r uct ion Mater ia ls Cor porat ion. Stoc kd a le has more t han 40 years of e x per ience in t he indust r y and cur rent ly ser ves as v ice cha ir of t he Spray Foam Col lat ion's Leadership Committee. He is a lso a member of t he Greater Houston Bu i lders A ssociat ion. For more infor mat ion, contact: Joe Stoc kd a le, jstoc kd a le@accel lapoly uret hane.com Type of Damage Size & Severity Extent per 100 ft. 2 (9.3 m 2 ) Recommended Repair Light ½ " diameter or less Less than 1 / 8 " deep Less than 10 cracks, cuts, and/or dents Coat and/or caulk dent, cuts, and cracks Note: Re-coat should be considered based on remaining service life of coating More than 20 cracks, cuts, and/or dents Recoat as required to fill in cracks Note: Some caulking may be required to seal deeper cracks Moderate ½ " to ¾ " diameter less than ¼ " deep Less than 10 cracks/dents Coat/caulk cracks More than 20 cracks, cuts, or dents Recoat as required to seal crack Note: Some caulking may be required to seal deaper cracks Heavy ¾ " to 1½ " ¼ " to ½ " deep Less than 10 cracks/dents Remove damaged SPF: Caulk holes and recoat as required More than 20 cracks/dents Scarf ½ " of roof surface: refoam and coat Severe 1½ " or larger ½ " or deeper Less than 10 cracks/dents Remove damaged SPF: Caulk holes and recoat as required More than 20 cracks/dents Scarf ¾ " of roof surface: refoam and coat SPF for Storm Areas Even in areas where major hail storms and other weather-related events are common, coated spray polyurethane foam (SPF) systems may be options for rooftops.